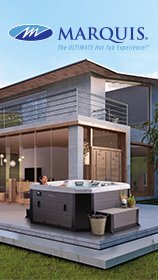 The main attraction at our Glastonbury Showroom is the wide selection of both Marquis and Passion Hot tubs. They come in a range of sizes from cosy corner spas to deluxe Swimspas and everything in between. All our Marquis Spas have a range of luxurious features including specialised aromatherapy ports, cutting edge self-cleaning technology and frog filtration systems that minimise effort and maximise efficiency. We also have permanently stocked shelves offering everything needed for pool maintenance including a wide range of both chemical and non-chemical pool sterilisation and clarification products. In addition to this we offer a selection of nets, brushes and both manual and automatic cleaners in order to keep your pool clean and sparkling. As well as water care, our pool store provides products that aim to enhance the enjoyment of your pool or spa, whether that be through aromatherapy crystals and scents for intense relaxation, or fun inflatables to keep the family entertained. Also available are the summer must-have Intex Easy-Up Pools, which come in a range of sizes and are guaranteed to cool you down during a hot Summer.